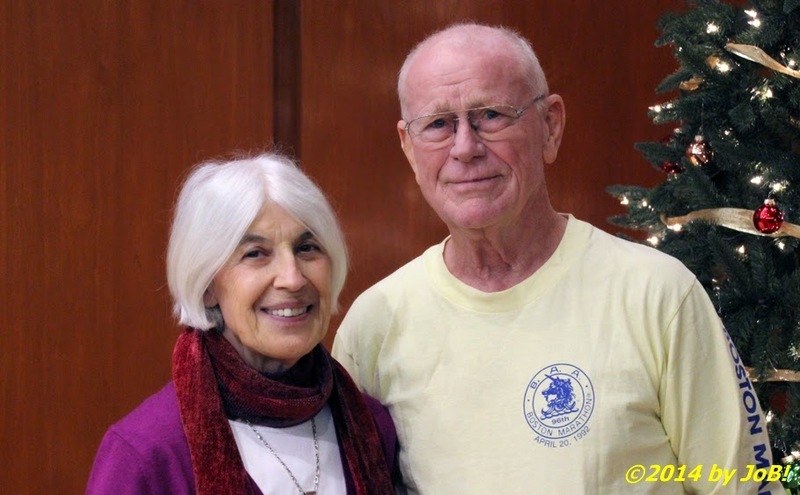 Elizabeth Roth Turner, left, and Ted Clark, right, attendees at the November 1964 speech given by the Dr. Martin Luther King, Jr. at the University of Dayton Fieldhouse, were in the audience at the Kennedy Union ballroom reflection event on Tuesday afternoon. On an overcast December afternoon, over 70 people attended an event to commemorate one held on a snowy November night 50 years ago last Saturday involving the appearance of an American civil rights icon in the city of Dayton. The University of Dayton's Office of Multicultural Affairs, the University Libraries, and the MLK Planning Committee hosted this gathering at the school's Kennedy Union ballroom to reflect on that November 1964 visit by the Reverend Dr. Martin Luther King Jr. and to discuss the social justice issues that continue to exist in this country a half century after his advocacy. 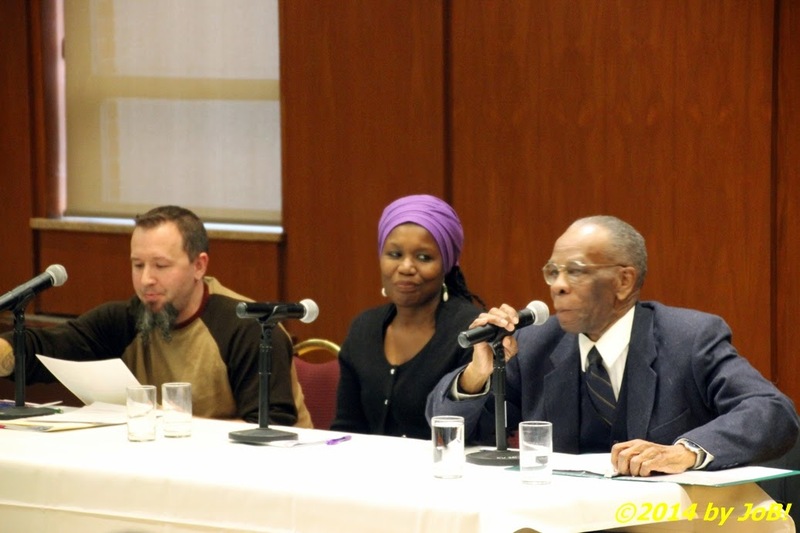 Remarks were provided by Dr. Herbert Walker, a poet, performer and Professor Emeritus in the Department of English at the school, Dr. Ruth Thompson-Miller, an Associate Professor of Sociology in the College of Arts of Sciences, and Dr. Tom Morgan, an Associate Professor of American and African American Literature in the Department of English. On November 29, 1964, Dr. King, in the auspices as president of the Southern Christian Leadership Conference, visited the University of Dayton to make a speech as part of the school's Freedom Forum lecture series. That event was held at the campus' fieldhouse less than two months after he was named the winner of and less than two weeks before traveling to Norway to receive the 1964 Nobel Peace Prize. 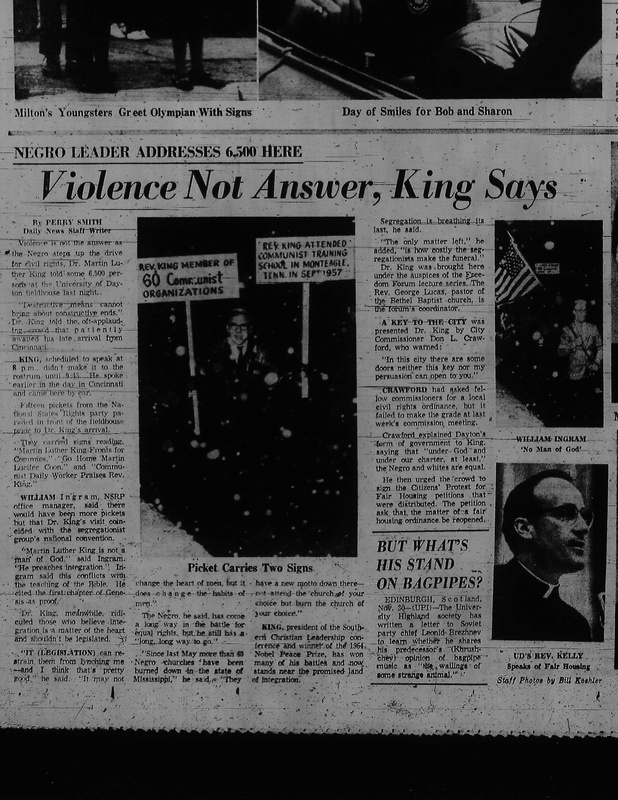 Due to the chance discovery in the spring of 2008 of a reel-to-reel tape from the event, a recording of most of the Alabama minister's remarks on race relations in the United States and his unwavering support of non-violent solutions for social injustice from that night exists online today (King's comments start at the 10:30 mark in the posted audio). An account of that night was published in the Dayton Daily News the following day to include remarks from protestors outside the venue. 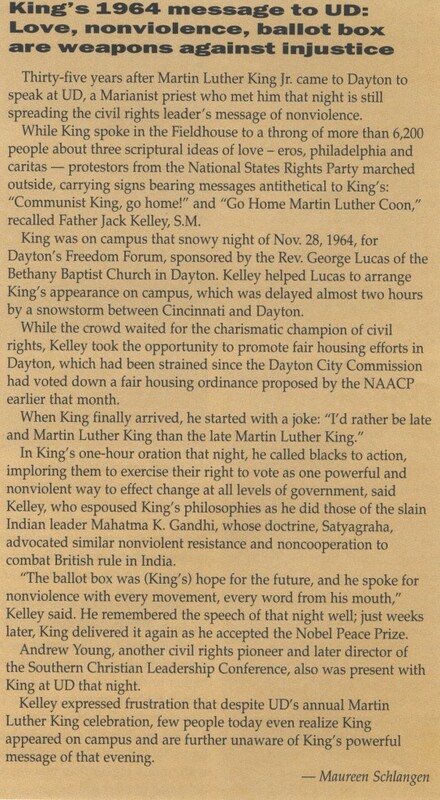 A January 1999 article for the Campus Report, the school's staff/faculty newspaper, printed a recollection of that speech by Father Jack Kelley, a former UD professor of religious studies and an advocate for social justice and interfaith dialogue, who also sat on the same stage with Dr. King on that wintery November evening. 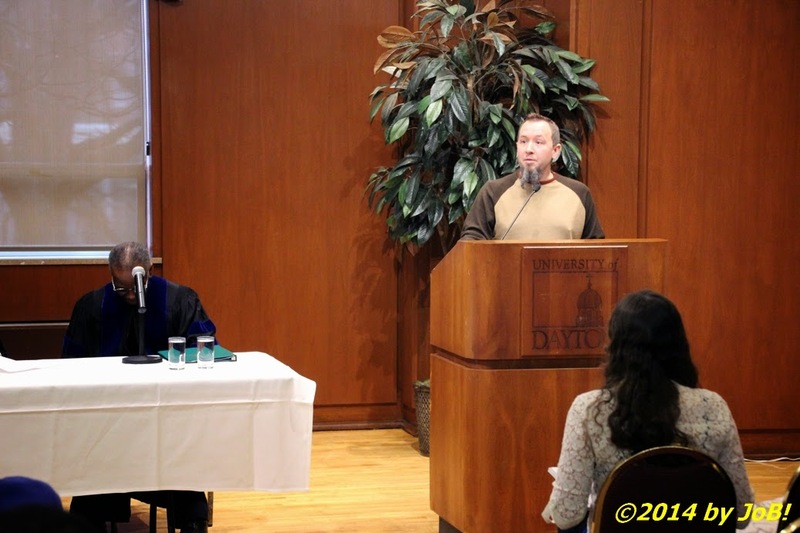 Dr. Tom Morgan, an Associate Professor of American and African American Literature in the Department of English at the University of Dayton, makes introductory remarks at the 50th anniversary reflecting event at the school's Kennedy Union ballroom on Tuesday afternoon. After introductory remarks by Dr. Morgan, Dr. Walker took to the podium to provide his personal excerpts from and insights about Dr. King's speech. Walker, a self-professed "packrat of effluvium" and the person who possessed the audio recording of that 1964 event, was a child of the "Great Migration" movement of African-Americans from the rural South to more urban areas of the country during the 1940s and he shared some of his childhood experiences within the confines of segregation before starting his commentary. On a visit back to his original home when he was 12 years old, he remembered his mother's warning of being on his best behavior and "minding his P's and Q's" in public to reduce the chances of attracting undue attention by law enforcement officials, a warning that is, unfortunately, still passed down to young males in many African-American households today. 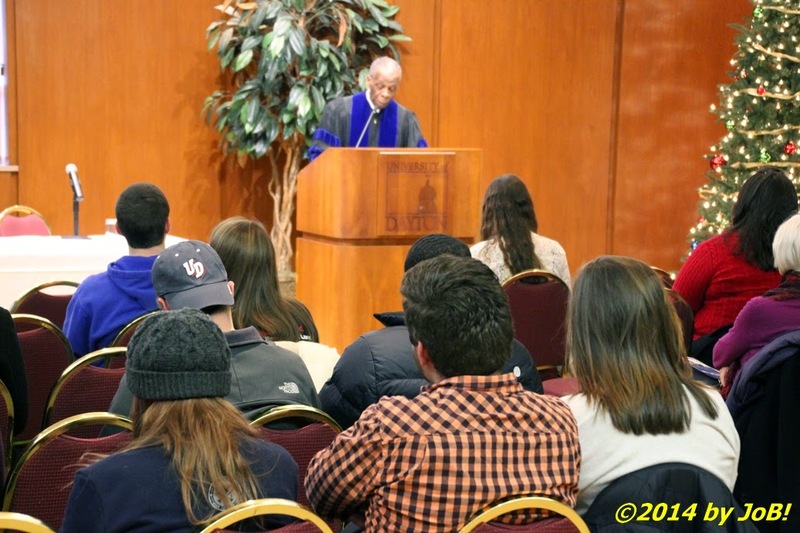 Dr. Herbert Walker, a poet, performer and Professor Emeritus at University of Dayton, delivers his personal selections from Dr. Martin Luther King's November 1964 speech at the school's fieldhouse to a Kennedy Union ballroom audience on Tuesday afternoon. Remarks about slavery, segregation and racial tensions peppered Dr. King's words on that long-ago November night and Dr. Walker stated that fallout from these past injustices still exist in the present day. 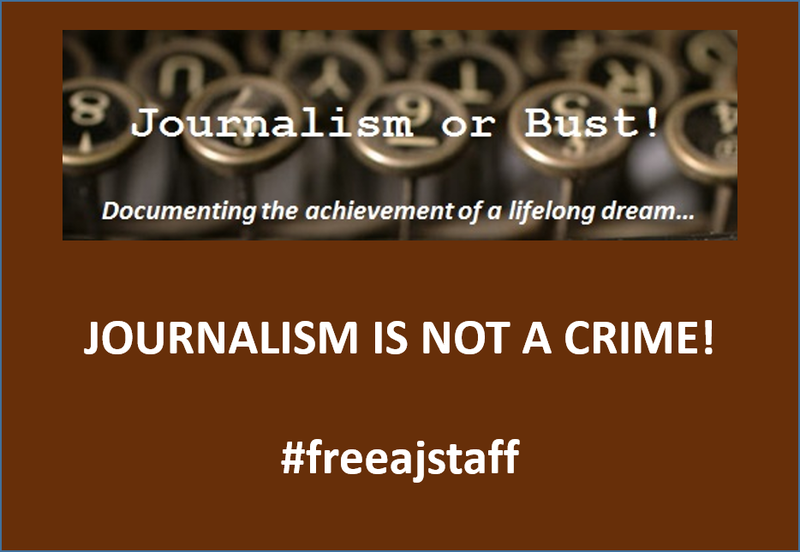 "Open your newspapers every day", he said, "turn on your televisions. You can look around in your community and you would have to agree with me that we still have a long way to go." These words mirror King's when, reflecting on the then-recent deaths of four African-American girls in a Birmingham, Alabama church bombing and the brutal murder of three civil rights workers near Philadelphia, Mississippi, he said "all of this reveals to us that we still have a long way to go. It means we have a long, long way to go before the brotherhood of man is a reality in our country." For his conclusion, Walker brought up King's aspirations of regulating human behavior instead of legislating morality because"legislation cannot change the hearts of men but it does change the habits of men" and while the goal of first class citizenship for all people can be achieved, "we must not use second-class methods to obtain it." Over 70 attendees filled the Kennedy Union's ballroom on Tuesday afternoon for the 50th anniversary reflecting event of Dr. Martin Luther King's November 1964 speech at the University of Dayton's fieldhouse. Dr. Thompson-Miller followed Dr. Walker and began by saying "the fact that Dr. Martin Luther King was on the campus of the University of Dayton in 1964 at the height of the Jim Crow era says so much" about the school's commitment to social justice which allows for students to "get something back" after they graduate and makes her feel proud of her association to the institution. From the November 1964 speech, she brought up the topics of economic injustice, "conniving measures" of voter suppression, and the categorization of African-Americans as "criminals" that also sound familiar and applicable in modern America. Dr. Ruth Thompson-Miller, an Associate Professor of Sociology in the College of Arts of Sciences at the University of Dayton, addresses the audience for the 50th anniversary reflecting event of Dr. Martin Luther King's November 1964 speech at the University of Dayton's fieldhouse on Tuesday afternoon. 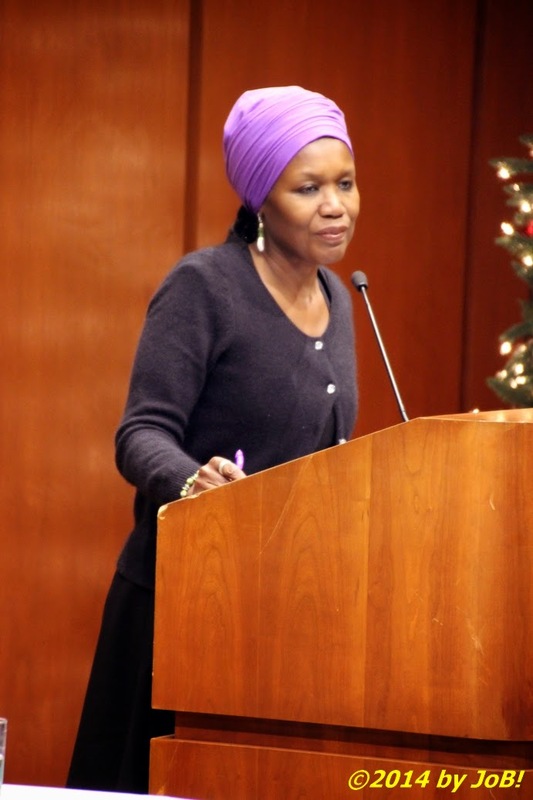 In reprising King's "long way" theme, she reflected upon her doctoral research with a group of elderly African-Americans who were exhibiting physical and psychological maladies normally seen among military members and first responders, labeling it "segregation stress syndrome", for simply surviving the turbulent and "war-like" segregationist years in the South. This accumulation of many stressful events eventually led African-Americans, like Rosa Parks of the Birmingham Bus Company strike fame, to fight back against Jim Crow-inspired, racially motivated injustices in order to achieve full citizenship for all. Thompson-Miller stated that research indicates an inter-generational aspect to this syndrome where those who were directly impacted worry more about their decedents' access to quality education and just treatment in this country's current social environment instead of special treatment or reparation "handouts" for themselves. She ended her remarks by mentioning King's famous quote about segregation being on its deathbed but updated it by saying that it remains on "life support" due to the racial divisions in our schools, our neighborhoods and in our daily social contacts in 21st century America. Citing a 2011 book by Ohio State University law professor and civil rights activist Michelle Alexander, she stated that there are more people of color that are in prison, on parole or in some manner of probation or surveillance system than were enslaved Africans prior to the start of the Civil War. While she alluded to King's not forgetting the victims of the Birmingham church bombing, Thompson-Miller added the names of Michael Brown, Trayvon Martin, Renisha McBride, Tamir Rice and John Crawford to our collective American memories. Dr. Tom Morgan, Dr. Ruth Thompson-Miller and Dr. Herbert Martin entertain questions from the audience for Tuesday afternoon's 50th anniversary reflecting event of Dr. Martin Luther King's November 1964 speech at the University of Dayton's fieldhouse. Dr. Morgan completed the formal portion of the event with his personal reflections of how Dr. King publicly called attention to America's failures to live up to the dream of equality for all. He brought up the activist's goal of obtaining moral ends through the use of moral means and this should be a goal to which that afternoon's attendees should aspire as well. He next excerpted three different speeches--the 1964 UD appearance, one from a 1957 visit to St. Louis, and the last given at Southern Methodist University in 1966--that embodied the "we've come a long, long way" theme that describes the progress of race relations in the United States. He then moved on to comments made by King about the psychological effects on both whites and blacks about the institution of slavery, a system "that ends up giving the segregator a false sense of superiority while leaving the segregated with a false sense of inferiority". Citing a recent Eric Michael Dyson article in The New York Times about the activities in Ferguson, Missouri, Morgan brought examples of disparate racial perspectives that hamper any honest communications on very important issues. For example, Dyson states that Officer Darren Wilson's description of Michael Brown's physical characteristics and the use of the impersonal pronoun "it" in his grand jury testimony reflected the perceived "menace" that dwells in the white mind when confronting an unknown young black male. He also brought up existing misconceptions when whites offer new "tough love" ideas to black communities to solve intraracial crime problems. 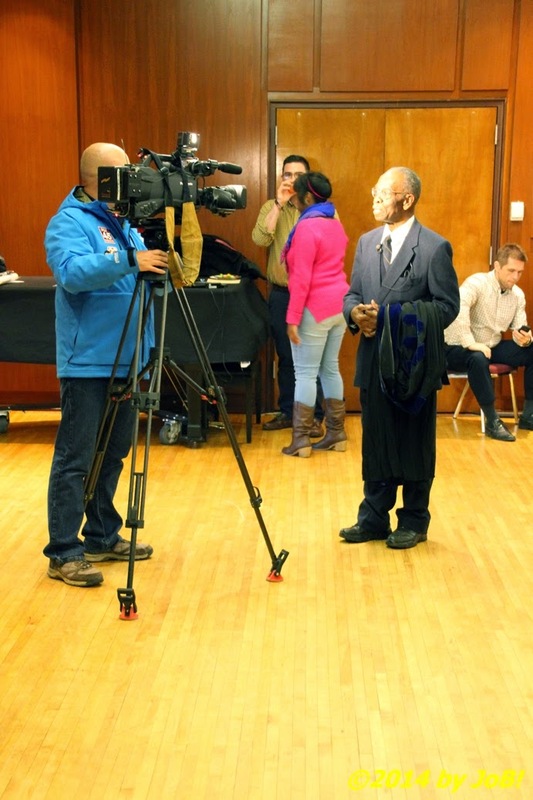 Dr. Herbert Martin, right, being interviewed for a local television station prior to the start of the 50th anniversary reflecting event of Dr. Martin Luther King's November 1964 speech at the University of Dayton's fieldhouse on Tuesday afternoon. Morgan ended his time by commenting on a September 1966 60 Minutes interview between Dr. King and correspondent Mike Wallace. During an exchange on the subject of "black power", he stated "a riot is the language of the unheard" because, at that time, America had failed to hear the economic plight of African-Americans up through the 1965 Watts and several other urban uprisings earlier that year. That comment did not compromise his staunch advocacy of non-violence to resolve those issues but he felt it would be "morally irresponsible" not to address the "contingent intolerable conditions" within the society that spark actions by those who feel no other alternatives to engaging in violent rebellion. 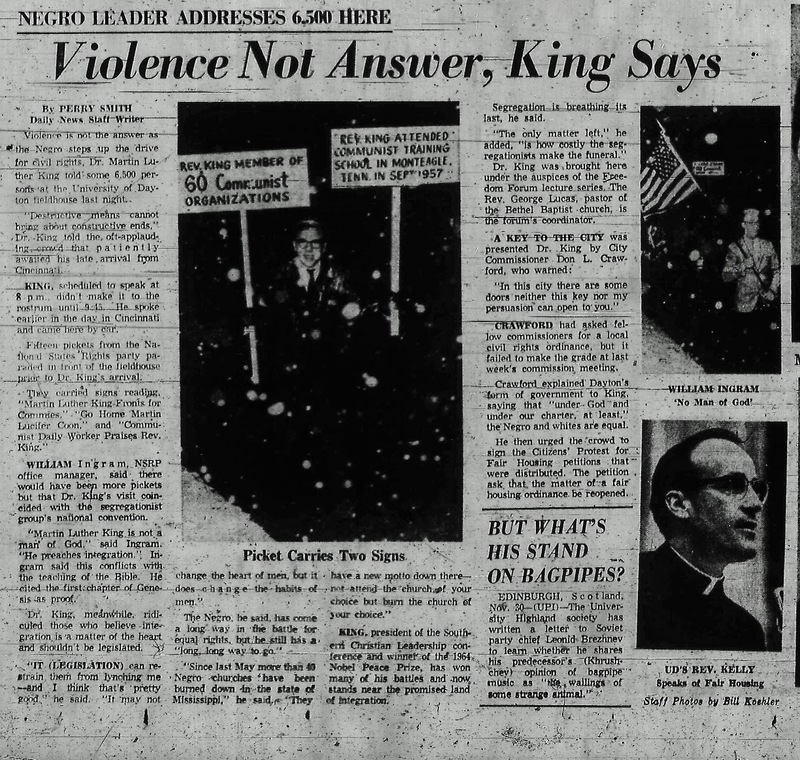 The English professor further elaborated upon the significance of King's riot comment in the use of his metaphor by another writer who conceptualizing the actions seen during riots in Chicago in the 1960s. "A riot is not random or illogical but rather an attempt to communicate when all other means have failed," he said, "and if we think about today, our challenge is to recapture and reanimate King's dream, to make it a living reality, one that can still provide hope for our collective nature." 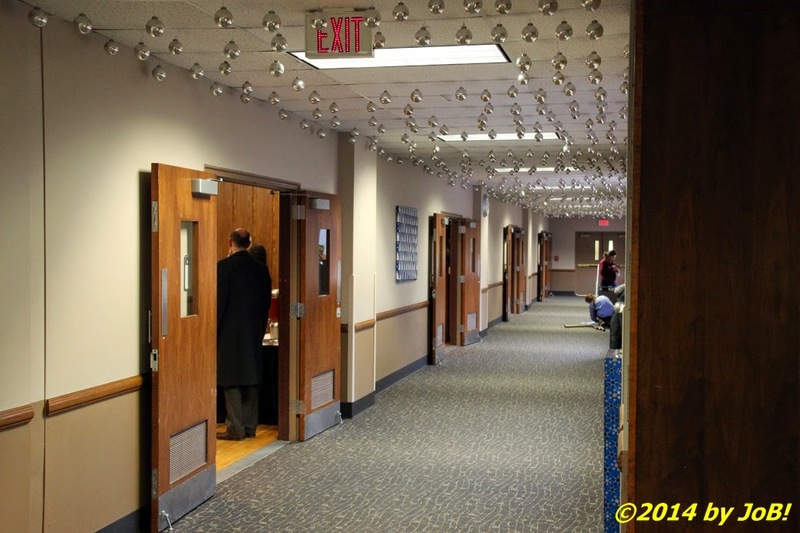 The University of Dayton's Kennedy Union ballroom served as the site for the 50th anniversary reflecting event of Dr. Martin Luther King's November 1964 speech at the University of Dayton's fieldhouse on Tuesday afternoon. The three speakers hosted a short question and answer session and it was at the end of this exchange when two individuals who were in the audience for that November 1964 Freedom Forum event were asked to provide their thoughts about the speech and its effect upon their lives. The first to speak was Elizabeth Roth Turner, an educator from Oakland, California who was then living with a family in Fayetteville, Ohio and simply wanted to expand her then-rural horizons when she tagged along on their trip to Dayton for King's appearance. Her future experiences involved working with the poor in the rural South and in Appalachian coal mining areas before she started a business school in Chicago that attracted many African-American and minority students. Earlier in the day, she received news that the area where she currently lives in the Bay Area is located was affected by Ferguson-inspired protests that turned violent. The other attendee, Ted Clark, is a retired IRS agent originally from Delphos, Ohio who had a personal connection with the Reverend George Lucas, the forum coordinator and pastor who was instrumental in getting Dr. King to attend. His comments primarily focused on the sights and sounds in the audience of nearly 6,500 people for that speech and he admitted that, up until the recent news coverage, he wasn't even aware of the counter protesting going on outside the fieldhouse. 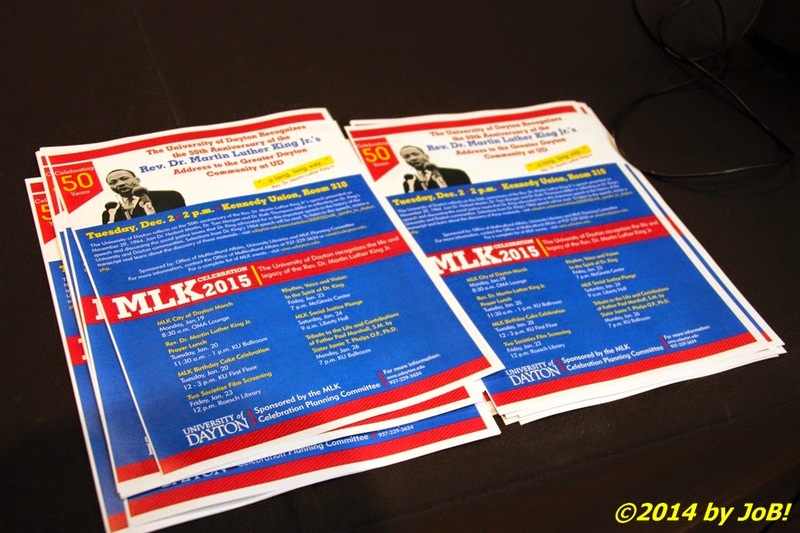 Handouts for upcoming Dayton area Dr. Martin Luther King life and legacy recognition activities were circulated at the 50th anniversary reflecting event at the school's Kennedy Union ballroom. 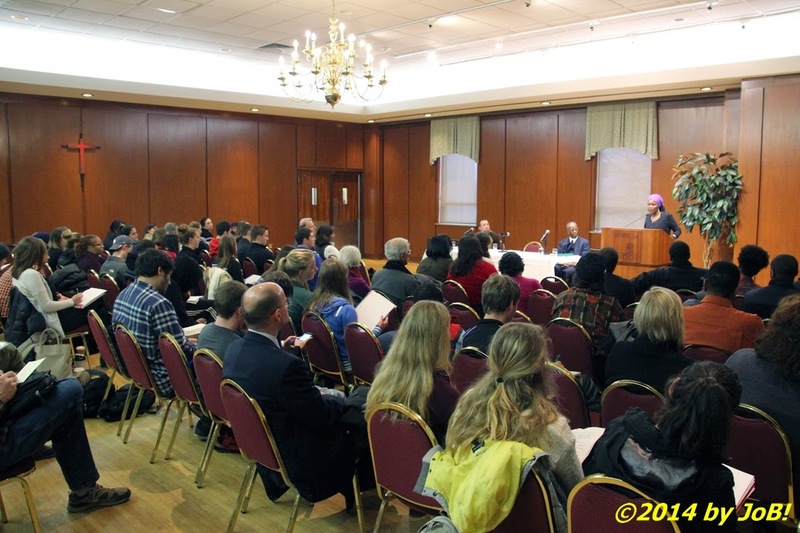 This reflection event was part of the University of Dayton's MLK Celebration 2015 which currently has seven events scheduled in January to commemorate the life and legacy of the civil rights leader. 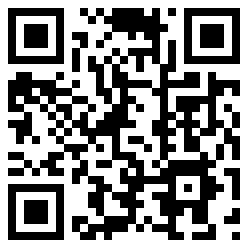 More information on those and other OMA happenings can be found at this link.